The tech wearables industry is booming, with the global market expected to exceed $19 billion by 2018. 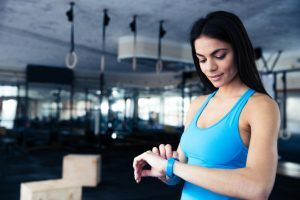 Fitness trackers have gained enormous popularity among large swathes of the population for their ease of use and ability to track numerous activities. Fitness trackers can help you with every aspect of physical fitness, including setting individualized goals. Use your new fitness tracker to obtain a baseline level of physical activity over your first week. Use that baseline to construct individualized goals for yourself, a feature that nearly every fitness tracker offers. This allows you to make gradual progress toward your larger goals, keeping you motivated to stay active. Keep track of your daily fitness activities. Early generation fitness trackers simply counted your daily number of steps. Now, fitness trackers can count nearly any type of activity. Waterproof tech wearables track swimming while other devices provide a heart rate monitor to give you a picture of your cardiovascular activity. Sync with other apps for an overall picture of health. Syncing your fitness tracker with other health apps can help you obtain a holistic picture of your health. For example, some fitness trackers sync with food tracking apps. This allows you to get a precise measurement of the number of calories burned versus the number of calories consumed. These features make tracking body weight and physical fitness goals easier than ever. Track metrics other than physical activity. Physical fitness is just one aspect of a healthy lifestyle. Many tech wearables measure your activity around the clock. This means that you can get easy to understand readouts about your sleep hygiene. Notice that you’ve been tossing or turning lately? Or maybe your resting heart rate is higher than usual? It could be time to take action to lower your stress levels. Benefit from expert advice and workout plans. Fitness tracking devices are more frequently offering bonus materials to support your physical fitness. For example, the Microsoft Band allows you to load gym workouts crafted by professionals. Following these guided workouts helps you stay motivated. Furthermore, using an expert workout plan may prevent orthopedic injury from joint overuse. At Southeast Orthopedic Specialists, we are excited about the potential for fitness trackers to help people reach their goals. However, it is important to remain vigilant about the onset of new sports injuries. Our sports medicine experts are here to help if you develop a nagging pain that just won’t go away, warranting a professional opinion.